May 12 is devoted to a sweet and rich confection that was probably invented accidentally. It’s National Nutty Fudge Day! The exact origin of fudge – a drier version of fondant, made by boiling sugar in milk until it reaches the soft ball stage and then beating it while it cools until it’s smooth and creamy – is unknown. Most historians believe that fudge, an American invention, was created by accident when a batch of caramels recrystallized, leading to the exclamation “Oh, fudge!” The earliest mention of the treat dates to 1886, when Vasser College student Emelyn Battersby Hartridge wrote a letter discussing how her schoolmate’s cousin made a batch of fudge in Baltimore and sold it for 40 cents a pound. Fudge became popular at women’s colleges because it tasted delicious and was easy to make: students could cook a batch using nothing but a gas light or chafing dish. Wellesley and Smith soon had their own versions of fudge floating around campus in the late 19th and early 20th centuries. This is going to make me sound terrible, but could there be a correlation between the popularity of fudge at women’s colleges, and…well…PMS? I’m just wondering. Some women do seem to crave chocolate during certain times of the month. Women aren’t the only ones who appreciate fudge, though. And there are no fewer than 3 fudge-related food holidays this year. I wasn’t actually sure where to find it, because fudge is one of those things you see all the time at bake sales, but rarely appears on grocery store shelves. My mom mentioned that a local produce store carries locally-made fudge, so we swung by there last weekend to pick up some fruits and veggies and, sure enough, were rewarded with fudge, too. So we grabbed a hunk of chocolate nut fudge to enjoy. It was creamy, nutty, and tasted great! If only it wasn’t nutty! I don’t like nuts in baked goods either. Not that they swell up like raisins but they just taste weird. I like nuts in desserts…they add a nice textural contrast. Thank you for not explaining again what you mean by exploding raisins. It looks and sounds amazing right now. I’ve never had much luck getting my fudge to turn out right when I make it. Might have to take another go at it soon though (as I am too cheap to pay the outragous prices places around here want for fudge). I’ve never tried homemade fudge. This chunk was something like $3.95, which isn’t bad at all. 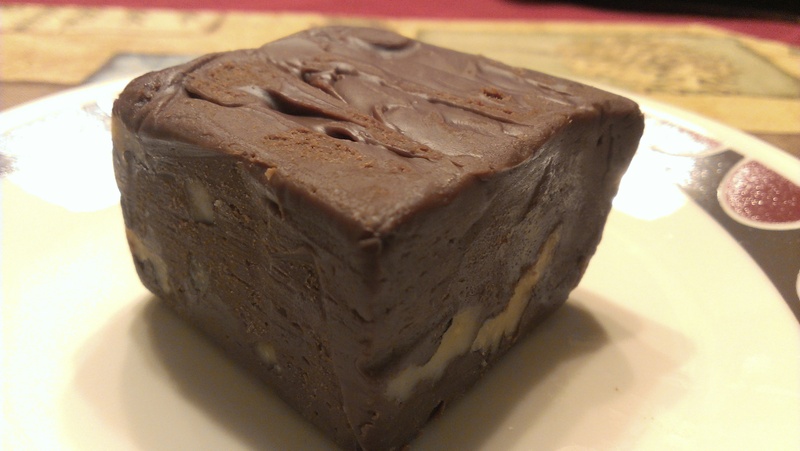 You should make microwave fudge…it is so EASY!